We’ve got some news. You won’t like it. But keep reading, you need to know. Hashtags are incredibly trendy and help you reach your intended audience, that’s why it’s important you know the following information! We don’t want you to lose out just because you hashtagged #popular. 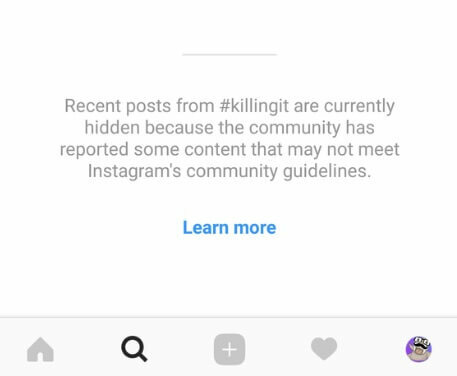 For about a year now, there has been lists of banned Instagram hashtags circulating the internet. Instagram has banned all hashtags that have inappropriate content associated with them. Though, some of the censored hashtags seem nonsensical. Why would they need to ban #gloves? Well… it must be because the internet has found a way to turn such a trivial hashtag into something inappropriate. How does this banning work? Meaning some of these hashtags may only be banned temporarily. As for completely banned hashtags, well, it’s as if they do not exist whatsoever. Searching for banned hashtags letter-for-letter will give you no results. Though, many have gone around this ‘issue’ by using variations of the words that are banned. For instance, #ilovemyinstagram yields no results, but #ilovemyinstagrame does. Bottom line, try to avoid using hashtags from either one of these categories if you want to make sure your posts reach your intended audience! Don’t waste your limited number of hashtags on banned ones! NOTE: most banned hashtags are inappropriate terms – which makes this entire situation pretty logical. We’ve chosen to include only the hashtags with double meanings seeing as the other partially banned hashtags were fairly explicit – rendering the banning self-explanatory. While doing some research, we also found these newly banned hashtags (which were not part of the other lists we found). They are currently only partially banned and seem quite trivial to us! If you’d like to view the full list of banned & partially banned hashtags, head over to Frenzr’s post!